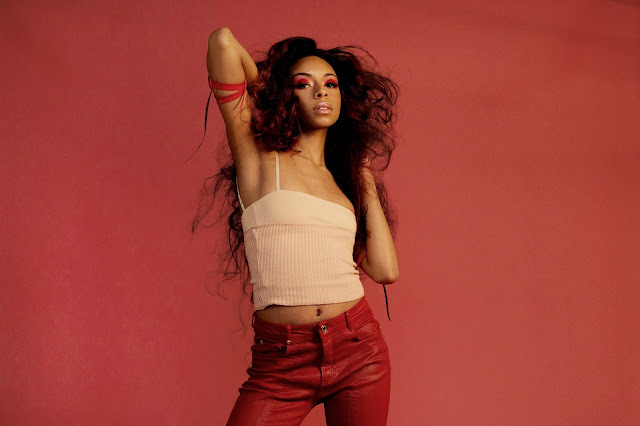 Floating colors and the warmest of smiles– that’s Chicago-based singer Ravyn Lenae in a nutshell. I stumbled upon her music a little over a year ago and was fortunate enough to see her in concert when she opened for Noname on her Telefone tour. Lenae’s debut EP Moon Shoes was unlike anything I’ve heard before, and her subtly captivating vocals accompanied my evenings for months on end. Her voice is easy to connect to, and her songs remind me of having late-night conversations with my best friends. Her next EP release, Midnight Moonlight, continued showcasing her honest lyrics; this EP was more like conversations while falling in love. Moon Shoes was yellows and pinks, Midnight Moonlight was deep blue and violet; Crush is scarlet, sticking within a red palette but exploring all ranges of the color. Lenae released a third EP on February 9th, and it’s her most mature (and some of her best) work to date. Crush is candid, thoughtful, and extremely well-produced. Guitarist, singer, and producer Steve Lacy worked with Lenae on this disc, and the team put together a set of songs that stay true to Lenae’s style but also push her out of her comfort zone just enough. The EP begins with the synth tones and funky guitar of “Sticky,” which was released earlier as a single. Lenae’s bright voice adds to the groove and brings in a high end to the song, creating a rhythm before she launches into the verses. The production and melody of this song are particularly clever: the vocals are given an almost gummy quality as Lenae cascades down a scale, and some of the verses start with a popping-like echo of the first word to create that further sticky effect. “Closer (Ode 2 U)” continues motifs like guitar plucks and vocalizations from “Sticky” in a different context. “Computer Luv” is soft and sultry, and it grows unafraid in exposing inward thoughts through its direct lyrics. Her luxurious vocals continue through “The Night Song,” in which the groove starts to pick up once more. The beat cuts out like a quiet gasp, and the high-frequency synth in the background creates a sense of motion that builds upon the dizzying effect of the other songs on the EP. The final song, “4 Leaf Clover,” stands out with its swinging drums and distorted rock vibes, wrapping up the tracklist with confidence. The songs flow together effortlessly, each a different shade of red swirling together to create Crush. This EP as a whole shows Lenae’s full embracing of her femininity and sexuality. She remains one of my favorite artists because she’s so unafraid to share her experiences, and she just continues to grow more and more. Her ease in connecting with her audience is incredible; she’s a young artist but has no trouble in sharing her specific perspectives with people of all ages through her music. Crush has been and will continue to be a staple in my playlists, and I can’t wait to see what colors she brings together next.